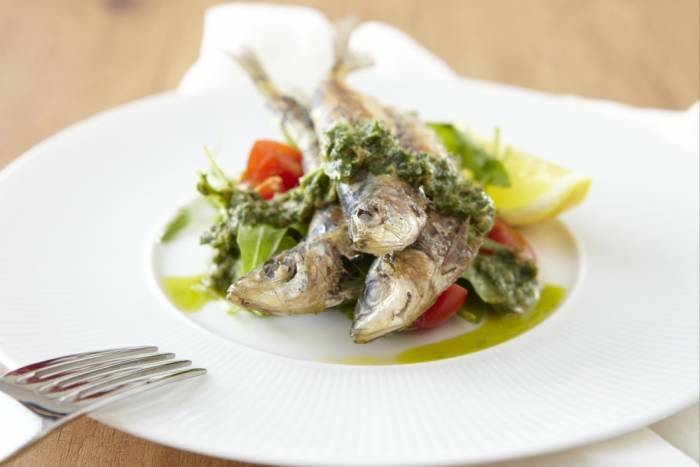 A fresh and light recipe - learn to fillet sardines, cook them on a griddle pan and serve with a rocket and cherry tomato salad and a home made salsa verde. Fillet the sardines and remove any pin bones. Prepare the salsa verde: remove the leaves form the parsley and mint and chop finely. Transfer thise ingredients to a pestle and mortar and add the garlic, mustard, capers and anchovy fillets. Add a pinch of salt and grind all the ingredients together before adding the olive oil. Check the seasoning and then set aside while you prepare the rest of the recipe. Wash and pick through the rocket leaves. Cut the cherry tomatoes in half. Mix with the rocket, season with salt and pepper and dress with olive oil and lemon juice. Pre-heat a griddle pan to very hot. Season the sardine fillets with sea salt and drizzle with a little olive oil. Place on the griddle and cook for 2 minutes on each side. Once cooked, remove from the pan and drizzle with a little lemon juice. Plate the rocket and cherry tomato salad and then top with the sardines. Finish with a good drizzle of the salsa verde to serve.